Samsung accidentally lets these emojis back on their phones, Facebook is testing Emoji 5.0, and Apple fixed the paella. 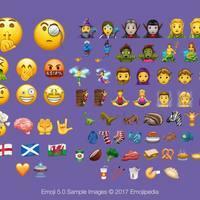 Unicode has today published the final emoji list for 2017 which includes zombies (with skin tones and genders), a giraffe, swearing face, and more. UTC announces redhead emoji progress, interracial emojis hit Windows, Android problems, and who actually owns emoji? iOS 10, iOS 10, iOS 10. Yes, it's all about iOS 10 this month.